Does anyone anywhere have an old photograph or grid list from any race anywhere from before 1982 showing a Chalon-bodied 914 racing with any group on any track? I'm trying to find some evidence to support eligibility to run mine in Vintage with RMVR. If I can prove that someone else raced one anywhere with any group, then I have a much better shot at having my car meet the RMVR eligibility requirements for 1981 and older cars. I've looked, but couldn't find anything. I also can't find any history of the Chalon body kits, specifically the years they were made. I thought they were produced starting in the late 70's and I've seen a date on some paperwork for a body that was being sold here on the World forum of 1984, and that body looked like a newer version of the one on my car. Any and all help appreciated. Who read the title as a "colon bodied car"
Get your mind out of the gutter, had to laugh! I think you will be hard pressed.. why? 1) Porsche's 914 "GT" was the basis for many a lookalike racers. 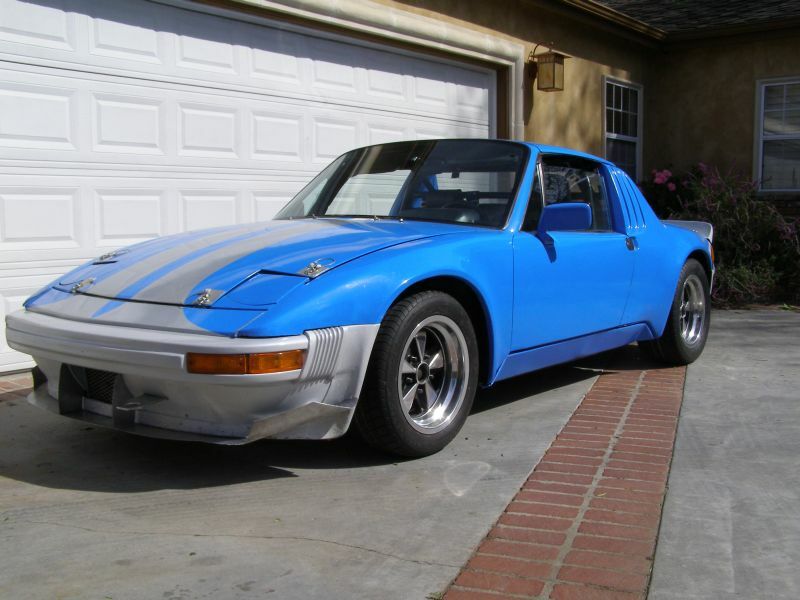 2) Sanctioning body rules about available mods for particular race classes would not have included a body kit that made a 914 look more like a 911. Most allowable kits (ie, Sheridan) maintained a somewhat 914 shape about them. 3) Weight. The Chalon kit, iirc, added quite a bit of weight the car.. which is the opposite of what you do to a "race" car. That said, I have seen 1-2 over the years, but only at DE events.. Not racing. I just blew my morning coffee out my nose all over the keyboard. I know of only one Shalom car that was actually raced, that was Andy Ritter's blue real /6. He sold it around 2006 and i don't think it was raced back in the 80's. Any idea of where and when Andy raced his car? Do you think he has any documentation, like a Logbook? Thanks for your relevant reply. He raced with PCA and i think POC in SoCal during the late 1990's and early 2000's. Yes, he must have had a logbook. Andy Ritter's car as above is the only one I am familiar with as well. At the time there were still multiple 914s active in POC. IIRC (50/50 odds at best) the Chalon kit was later removed from that car. I haven't seen Andy in a few years but may still have his contact info. I'm sorry I don't have more helpful input. or buy a different chassis and build it to taste? Yes Brant, those seem to be my options at present if I want to continue racing Vintage. I'm thinking of buying a shell and swapping over all the good stuff to it, or buying fenders and bumpers and stripping the Chalon kit from the existing tub. Too bad, because the car is set up nicely now, and although I know I'm in the minority here, I really like the Chalon body and would like to keep it. Maybe I can graft onto the front fenders so they look like the ones on the Sheridan kit, which look close to stock with the turn signal buckets protruding forward. Then there's the V-8 issue if I put the 215 Buick into it.... At least I can continue racing it with SCCA as it is. Or, you could do like some of us other nut jobs and run it in Chumpcar (now named Champcar). check it out. would a V8 Chalon have qualified for IMSA in 1976? the key point to research is does imsa allow a motor transplant car or not? you may want to call him and pick his brain as the standing IMSA guru. I think GTU was 2.5 in 76...maybe GTO, as a non porsche special...? the rational at the time those IMSA rules were adopted by rmvr was that no gtu cars were interested and the person writing and researching the imsa rules saw no reason to write gtu rules and do the work for a class that no one was interested in. so 6 and 8cylinder cars are currently legal.... 4cylinders are not until someone puts in the hours to write and refine the rules, and then puts it through the board. sometimes vintage rules are weird... because the person volunteering all of their time is only willing to do so much free work. I was getting the feeling that my chances would be better if I had the V-8 installed. And I was thinking IMSA too. Great stuff you guys. IMSA rules in general were more lax than SCCA, and I'd guess would allow Chalon bodywork. I recall that AIR and Hoesman both made slant nose 914 bodywork that was raced in IMSA. I don't know about the engine swap idea though. I suspect they drew the line at keeping engine and chassis manufacturer consistent. I've found old IMSA rulebooks by Googling for a restoration project I'm working on. Try looking for the old AAGT or GTX class rules from the late 70s / early 80s. They were the most liberal classes back then. There was a twin turbo 914 that competed in IMSA at one point, probably in one of those classes. Then contact vintage orgs that run in your area with your findings. Or as suggested just contact them and see if they'll work with you. Some are more open minded than others. Thanks Scott, and all others who have been trying to help. The IMSA angle so far seems the most likely, and I'm working with people from the Rocky Mountsin Vintage Racing (RMVR) club here in Colorado to try to find a way to achieve eligibility and get a logbook. I think it's mostly the slope nose front fender profile that is giving them a problem. Maybe the AIR and Hoesman IMSA connection might help there. I'll do a little more research myself, and Brant is helping me with RMVR Eligibility in researching the IMSA engine swap issue. At least the car and motor(s) are all in the correct date range, and maybe even the body kit as well. Here's a link to a pic of what appears to be a slant nose 914 running in IMSA in 1980. I believe one of the guys on the forum is restoring this car now! Perhaps it's not a coincidence that Hoesman Fiberglass appears to have been one of the sponsors of this car at least some of the time. That photo certainly might help. Thanks for digging it out. I'd love to talk with whoever is currently restoring that car, and get pictures of the logbook. This looks to be a California track. Slant nose fenders. 916 nose. Could be just a track day. Probably no help? Every picture of a slope nose Chalon-like car in a period racing environment might help establish eligibility with the Vintage crowd. Thanks for digging up the photo. Looks a bit Group 5ish but also a bit slope nosed. Definitely looks slope nosed and quite a bit Chalon-like, although the front fenders appear to be even more flared than the standard Chalon body. Wonder who was running that car, and where and when this photo was taken. As for the poor 911 and driver, that's the original meaning of being "upside down" in a car, in bleak contrast to the current meaning of only owing more than it's worth. Thanks for posting this picture. The 914 nose in this last picture looks like the usual Topper Chasse IMSA nose. The picture is a little grainy, but I think I can make out the 914 turn signal protrusions (all fiberglass, of course). [Edit] Actually, I see the car is number 29. Earl Roe's 914 sometimes ran that number and had a similar paint scheme. [Another edit] That looks like the downhill left hander (turn 6) at Watkins Glen. Found another slope nose 914 from IMSA archives. This one raced in 1983, so possibly not helpful. But I figured might as well post it. Looks like the AIR Group 5 nose. Bill Swope at Portland in 1983.